A License consists in a grant to a user, or a group of users to access one or multiple products. A License is uniquely identified in BLT by its Activation Key. This means that you cannot have multiple licenses with the same Activation Key. A License is defined by its Attributes and you can give it permissions to specific Products and Features. You can access and manage your licenses from the tree. •A single license can be used by multiple users on multiple machines for with multiple products. •If your product allows it, new users will be able to register for a trial license by themselves with their email address. For security reason, you cannot have multiple licenses with the same email address having access permissions to the same product. This will prevent users to register multiple times for a trial license with a specific product. 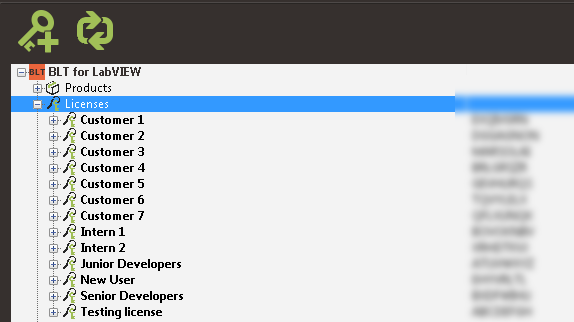 When an end-user has activated a product, your program continues to monitor the state of the license in background and synchronize it with the Licensing Server. 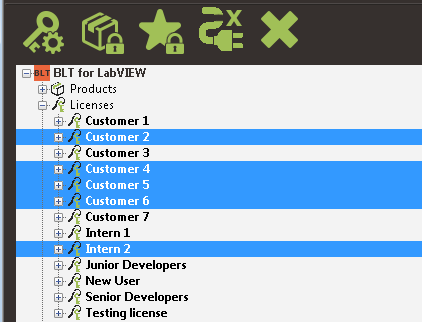 So you can change the license or product attributes in BLT and have the modifications applied on the end-user's side without having him to restart the program. When a someone is using a product distributed with BLT, he can press and hold F11 key on his keyboard to display his license attributes and settings as well as the product change log.